The Purple and WhiteCommunity Involvement: Does That Ring a Bell? Community Involvement: Does That Ring a Bell? As many of you may know, senior chemistry major, Abed Haddad has been working with Significant Developments, LLC on a community art project commissioned by the Mississippi Museum of Art as part of their C3 Project: Creativity. Conversation. Community Series. What is this project, you may ask? 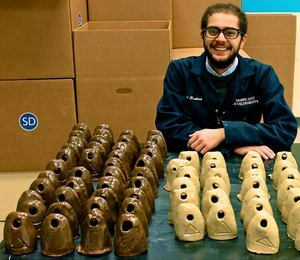 Significant Developments, LLC has put in place an assembly line to inscribe clay bells with personal symbols representing the individuals in the community, all culminating in a public installation to be unveiled on March 20th. However, this project does not belong to the company alone. Significant Developments, by means of this project, will be able to produce a beautiful work of art and also create dialogue about relational aesthetics. The goal of this contemporary artistic movement is to generate artwork that brings the community together in order to produce even the smallest ephemeral interactions. Cool, right? And it’s really easy to participate! In order to make the bells, a participant first measures a pound and a half of clay; then proceeds to roll out said clay and cut it into the basic bell stencil. 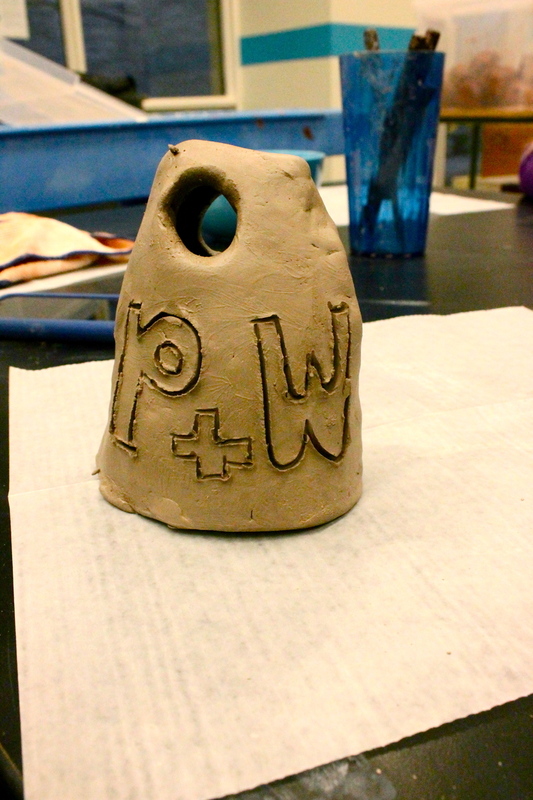 The next step involves using the cut clay to form the bell. After the bell has been shaped, it is set aside to harden before it is inscribed. The inscription portion of the project is even easier for those art-o-phobes! There are three different options to choose from to get a symbol inscribed. You can draw a design, snap a picture of it, email it to Daniel@significantdevelopments.us, and another participant will inscribe it for you. Or you could design and inscribe your own symbol at the museum, or choose someone else’s design out of the box of submitted designs to inscribe. No matter which option you choose, you are contributing to the project in a very unique and important way. Because of its process, this project involves and represents our community in a multitude of ways. First of all, each of the symbols represents a different member, and the combination of them all hanging up will represent the diversity of the community. Secondly, it is almost always the case that one single bell is made with the assistance of many different people. Your bell is not simply your bell, and the assembly line set-up ensures that fact. Two people may not perceive each inscription the same, adding perspective to the project. Mississippi is a state known for its crafts, and what better way to celebrate our State than with a project that represents its diversity so well? Significant Developments, LLC was founded by Millsaps alum and Chief Aesthetics Officer Daniel Johnson ‘11, alongside his wife and Chief Experience Officer, Amber Kellum Johnson. Both hope to continue in their mission of creating more projects that benefit both our community and its artists. Abed Haddad, with Kira Cummings, are currently serving as Significant Developments’ Change Agents for the project. Abed Haddad with his bells! I had the pleasure of going to the museum with Abed to create a bell for myself. Believe me when I say that it is not only simple, but also exciting, fun, and therapeutic. The best part is that this project is exactly what you make it. If you want help making your bell, Change Agents, or even other participants, will help you and guide you. However, if you want to simply work quietly and on your own, the museum provides a perfectly relaxed environment to do so. CAO Daniel Johnson works directly in the workshop on Thursdays from 10 AM until 2 PM and Saturdays from 1PM until 5PM. However, anyone is welcome to create a bell any time that the museum is open. The workshop remains open constantly for this purpose in the Entergy Classroom. I highly recommend participating in this wonderful project! For more information, contact 601.497.7457, visit www.msmuseumart.org, or come and speak to Abed or myself. This project will be going on until March 14th when the museum will cease to take inscription submissions. The final product will be on display in the Art Garden on March 20th. I hope to see more Millsapians involved than they have been. We freely admit that we help and give back to our community, so I feel that we need to better express that we are in fact, a part of it. This is our community. Let’s get involved!